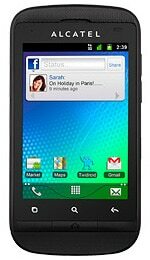 The Alcatel One Touch 922 is an entry level NFC smartphone. The Android 2.3 device offers a 3.2-inch touchscreen and is powered by a 650MHz MediaTek MT6573 processor. The One Touch 922 is available in Russia through MegaFon for 3,990 Rubles (US$131).